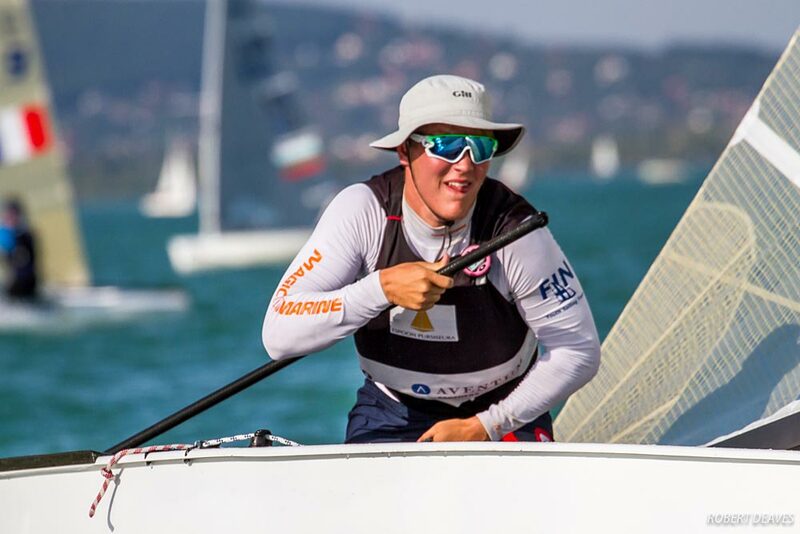 Another long day of waiting for wind was rewarded with two late races on Day 4 of the U23 Finn World Championship in Balatonfüred, Hungary. Oskari Muhonen, from Finland, won the day to now lead the fleet by five points. He very nearly won both races. Facundo Olezza, from Argentina, had a day to forget and dropped to second, while Fionn Lyden, of Ireland, had a stellar day to climb to third. The long postponement was lifted just after 15.30 when a light southerly established itself on the lake following a day of zero breeze and sweltering temperatures. By race time it was 6-8 knots and the best breeze the sailors had seen for three days. 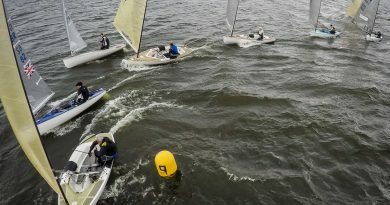 Lyden led round the top after favouring the left from Henry Wetherell, from Britain, and Joan Cardona Méndez, of Spain. Lyden still led at the gate but a crazy second beat let Wetherell through to the lead. He looked to have it sealed but Muhonen caught him downwind, and was ahead at the gate, but on the outside. Wetherall just crossed the finish ahead, but overlapped with Muhonen, with Lyden a comfortable third. Three of the top 10 picked up a UFD starting penalty, including regatta leader Olezza. Race 6 was started without delay to make best use of the breeze and this time Lars Johan Brodtkorb led at the top but he infringed Muhonen, who took the lead and sailed away for a huge win. The next boat was not even round the leeward mark as he crossed the finish. 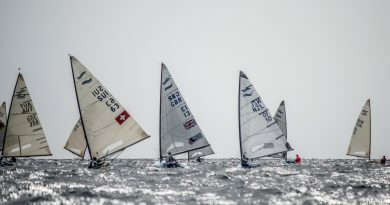 Lyden controlled second place all the way with Jack Arnell, from Britain, moving up to third on the second beat, but was then passed by Brodtkorb on the final downwind. 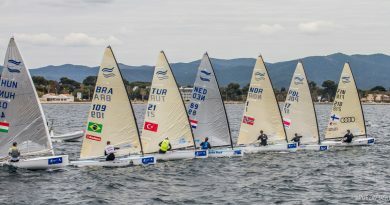 As the fleet finished, the wind was still in place, albeit lighter, and the race team tried to get a third race in but after two false starts they called it a day with the setting sun spreading its golden light across the usually green Lake Balaton. Muhonen moved from sixth to first overall after his day’s work and is now where he wants to be. Muhonen has only been in the class for just over a year. “I came into the Finn because I got to big for the Laser.” Before that he sailed Optimist, Europe and Laser. 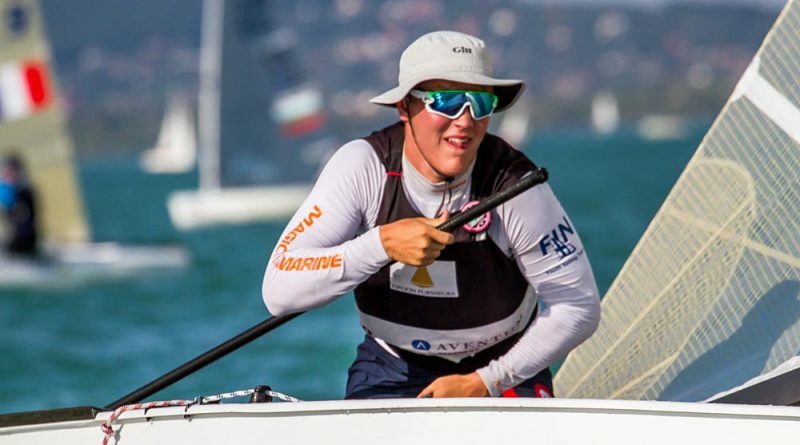 He won a few National titles in the Europe, and was 10th at the Laser youth worlds. If today shows anything it is that Balaton still has a lot of surprises in store, and no one can rely on anything. Day 4 produced lots of high scores throughout the leader board and lots of lessons learned. There are still a maximum of six races left to sail, so the championship could be considered only half way through, with just two days to go.